In December, we published the rules controlling choice of caliber and bullet weight for Palma competition. (CLICK HERE to Read.) 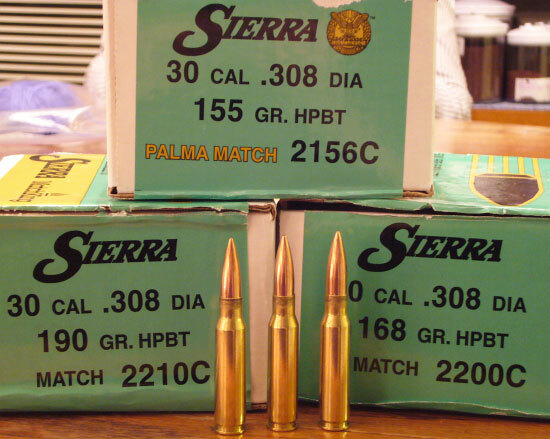 In the USA, some events are still limited to 156gr or lighter bullets for .308-caliber shooters. But where such restrictions don’t exist, many shooters are using heavy 175-190gr bullets in their .308s. Is the heavier bullet always better? 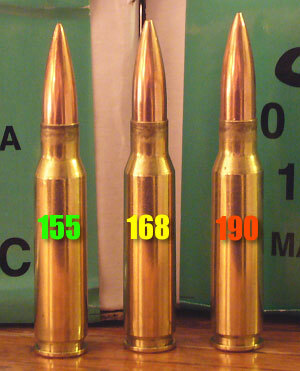 What considerations favor the lighter 155gr-class bullets in Palma competition? Top Palma shooter Kelly Bachand addresses these questions in today’s commentary. It is clear that 155gr bullets are adequate. In the Palma game, more matches have been won and more 450 scores have been shot with 155gr bullets than with any other weight projectile. With the NRA allowing heavier bullets in Palma matches, many shooters prefer to shoot the longer, heavier bullets when possible. With their higher BCs, the longer bullets would seem to offer a ballistic advantage. There may be an edge, but in my opinion, it comes at a high cost. Shooting a heavier bullet adds complications. You’ll probably need a different powder and new load development will have to be done. New zeroes must be calculated and confirmed on the range. An expensive new barrel with a faster twist rate may be needed to stabilize the heavier bullets. And unless you’re lucky, there’s a chance that the new barrel is less accurate than your existing barrel. (If you’ve got a “hummer” barrel for the 155s, what are the odds of getting another one as good for the 190s?) For a shooter who only competes domestically and who has plenty of time and money, this does not pose much of a problem, as he can work up multiple loads and acquire multiple barrels, or even build up a second complete rifle. But shooting BOTH the 155s and the heavy bullets (which may require a new barrel) certainly adds to the cost of competing, and the time required to work up loads. One who also competes internationally has much more to worry about, since you’ll likely be switching between the heavy bullets for most domestic matches and the 155s for most international matches. Consider the challenges you’ll encounter switching between a heavy-bullet domestic load and a 155gr international load. Will changing between two different loads (with very different recoil levels) alter your gun-handling and follow-through? Will having two loads (with different ballistics) create confusion when making wind calls? And if you DO shoot both 155s and 190s, should you have two different barrels, or should you stick to one barrel which is adequate for both bullet weights, but perhaps not optimal for either? The heavier bullets typically have a better BC which means they should be less bothered by the wind. At the same time the heavier bullets travel at a much slower velocity. Does this negate the ballistic advantage? You need to check the ballistic tables carefully, looking at BOTH BC and velocity. As a person who prefers to keep things simple and stick with what works, it’s no surprise I continue to shoot 155gr bullets exclusively in Palma competitions. But I understand this is just one viewpoint. A Palma shooter reading this should survey competitors who are consistently putting themselves in the winner’s circle. Talk to top shooters and then make your own rational, informed decision about which bullets to use. Good luck and keep them in the center. Share the post "Palma Projectiles: 155s vs. the Heavier 30-Caliber Bullets"
Every prone shooter needs a shooting mat, whether you’re shooting in competition, or stalking critters on a walk-around varmint safari. If you’re looking for an inexpensive mat that’s easy to carry, check out the MidwayUSA Competition Shooting Mat. Regularly priced at $49.99, this mat is on sale right now for just $24.99. The $24.99 sale price is good now through Feb 28, 2010. Sized 69″ Long x 27″ Wide, this mat rolls up into a 6-7″ diameter “sausage” for transport or storage. The mat has rubberized elbow and knee pads; the mat is about .325″ thick at the elbow pads and .350″ thick at the knee pads. While we prefer a wider mat (with more room for ammo boxes and shooting accessories), this mat has many nice features. Grommets on the corners allow the mat to be staked down in high winds. The bottom has a non-skid texture so it doesn’t slide around, and the mat comes with both a carry handle and a shoulder strap. 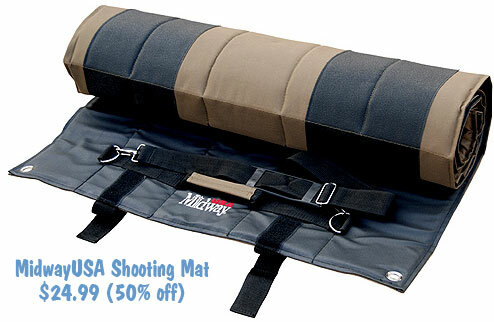 Share the post "Hot Deal: $24.99 Shooting Mat from MidwayUSA"